On July 28, 2000, the Fish and Game Commission (Commission) received a petition to list coho salmon north of San Francisco as an endangered species under provisions of the California Endangered Species Act (CESA). The Commission referred the petition to the Department of Fish and Game (Department) on August 7, 2000, for evaluation. The Department found that the information in the petition was sufficient to indicate the action may be warranted and recommended the Commission accept the petition. The petition was accepted by the Commission on April 5, 2001. 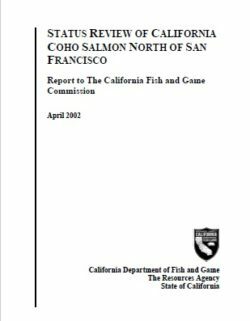 On April 27, 2001 the Commission published a Notice of Findings in the California Regulatory Notice Register declaring coho salmon a candidate species, thereby starting the candidacy period. Many West Coast salmon and steelhead (Oncorhynchus sp.) stocks have declined substantially from their historic numbers and now are at a fraction of their historical abundance. There are several factors that contribute to these declines, including: overfishing, loss of freshwater and estuarine habitat, hydropower development, poor ocean conditions, and hatchery practices. These factors collectively led to the National Marine Fisheries Service‘s (NMFS) listing of 28 salmon and steelhead stocks in California, Idaho, Oregon, and Washington under the Federal Endangered Species Act (ESA). The ESA, under section 4(c)(2), directs the Secretary of Commerce to review the listing classification of threatened and endangered species at least once every five years. After completing this review, the Secretary must determine if any species should be: (1) removed from the list; (2) have its status changed from threatened to endangered; or (3) have its status changed from endangered to threatened. The most recent listing determinations for most salmon and steelhead occurred in 2011. NMFS completed a 5-year status review in 2011 and concluded the status for endangered Central California Coast (CCC) coho salmon should remain the same. 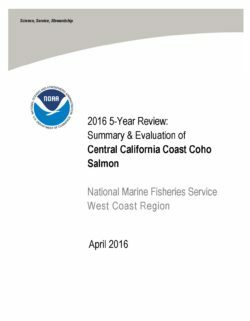 This document summarizes NMFS’s current 5-year review for the endangered CCC coho salmon. Many West Coast salmon and steelhead (Oncorhynchus spp.) stocks have declined substantially from their historic numbers and now are at a fraction of their historical abundance. There are several factors that contribute to these declines, including overfishing, loss of freshwater and estuarine habitat, hydropower development, poor ocean conditions, and hatchery practices. These factors collectively led the National Marine Fisheries Service to list 28 salmon and steelhead stocks in California, Idaho, Oregon, and Washington under the Federal Endangered Species Act (ESA). The ESA, under section 4(c)(2), directs the Secretary of Commerce to review the listing classification of threatened and endangered species at least once every five years. After completing this review, the Secretary must determine if any species should be: (1) removed from the list; (2) have its status changed from threatened to endangered; or (3) have its status changed from endangered to threatened. Such reviews for the Southern Oregon/Northern California Coast (SONCC) coho salmon Evolutionarily Significant Unit (ESU) occurred in 2005 (Good et al. 2005) and 2011 (NMFS 2011). 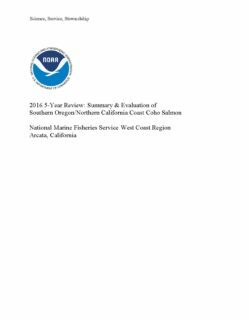 This document describes the results of the 2015 review of ESA-listed SONCC coho salmon.